It’s an obvious point to make really, but an important one. The front cover of a book can make or break it. In the days of old, the cover could mean the difference between picking a particular book up from the shelf and reading it and it languishing on the shelf, unloved, undiscovered and gathering dust. In today’s world of online retail, it’s probably even more important that the cover stands out. You have to consider how it looks on screen, as well as on the shelf. Not only that, it must look good as a thumbnail as well as full-size. It doesn’t matter how amazingly brilliant the content is, if the cover doesn’t “speak” to your audience, they won’t take a closer look. And I get the feeling that’s what’s happening with Pegasus Falling. Judging by the reviews, everyone who’s reading it is loving it, but I’ve felt that something is stopping people who are happening upon it by chance from picking it up, and I think it’s the cover. Although I like the cover of Pegasus Falling, I’ve never felt 100% happy with it. The image, taken last summer by the talented photographer Dewi Clough with the help of a group of family and friends, is powerful and striking. But somehow, I felt that I haven’t been able to do it justice. I’m no graphic designer – and I’ve never pretended to be. I’m operating on the tightest of budgets and can’t afford to hire one. So, I’ve put the cover together using Photoshop Elements and Publisher. I haven’t just thrown myself in to the project blind, though. At all stages of the design, I consulted book covers – hundreds of them – to see what worked and what didn’t, and have tried to emulate them. 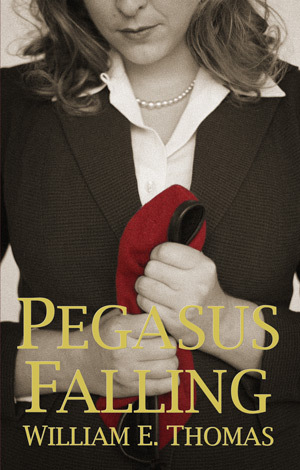 With the release of Pegasus Falling in the US last month, I decided to try and tweak the cover artwork to see if I couldn’t give it that killer “look”. I tried to highlight the text more, and took off a grain effect which was supposed to age the picture, but when printed just looked like it was pixelated. But the more I looked at the proof, the less I liked it. There was still something not quite right about it, and I’ve spent the last two days tinkering further with the design. I’ve been looking over other book covers, both mainstream and indie, and noted down what works and what doesn’t, and fixed upon two problems with our cover. Firstly, the image is too dark. Colours on covers of literary and historical fiction books, I’ve noted, tend to be bleak and washed out wit the occasional splash of a single colour. I wanted to keep the motif of the red beret against the black and white background, but experimented with washing out the colours in photoshop. Secondly, the text was all wrong. Everything from the font and the colour to the size and its position was all plain wrong. It felt tacky…not the impression I was going for! A problem with this image is that it takes up the entire cover – there aren’t many spaces to fit in the graphics – no dead space to fill with words. If we were taking the photo again, I’d re-frame it to take this in to account, but that’s not an option, so I’ve had to work with what we’ve got. But the biggest difference has been changing the font. I used Lucida Bright before, a respectable classic typeface, but still too heavy. Now, I’ve gone for Trajan Pro – the graphic designer’s favourite. And there’s a reason for that. It works. Scale down the title and author name, fit both on one line each, place them both within the darker space under the hands at the bottom, remove the gold colour and hey presto, I think we’re on to a winner. Finally, I think I’m happy with the cover. It may not be a design classic, and a graphic designer undoubtedly could do better, but I like it. It’s more sophisticated, somehow. And this time, I’m putting it to bed. It’s time I moved my attention fully over to It Never Was You. You can be sure I’ll have learned a lot of lessons from what I’ve gone through designing this one, and they’ll all be implemented for Part 2. I just hope I can get it right first time, next time. So, what do you think of the new design? Is it an improvement? Was I right to make the changes? Let me know by leaving your comments below.